With the InterFAX Receive service, others send faxes to you on a number previously allocated to you by InterFAX. When using the InterFAX API, received faxes will wait on our service until they are collected by your application. Your application can determine that new faxes have arrived on your number by either polling the API using one of our get list methods or by awaiting callback from InterFAX. Please note, if you poll the web service for new faxes, there is a limitation on the number of requests you can submit in a specific time frame. Please review our system limitations for more details. 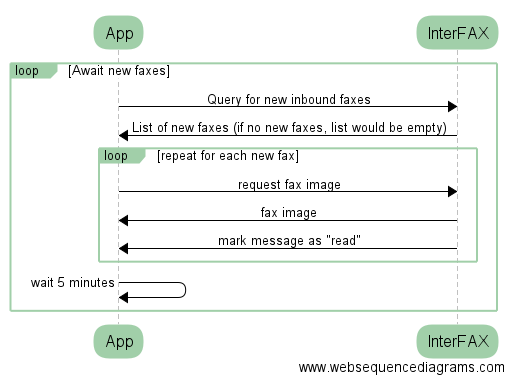 Once a new fax is available, your application can collect the fax image by using the get image method in the API. Make sure to mark your fax as read by calling the Mark Message method to avoid it being returned by subsequent polling.